Reflecting on Mary and her role in the history of salvation helps us to know how we too can give glory to God by our lives. This was the focus of the Centre for Faith Enrichment’s ‘Retreat on Mary’ last weekend. 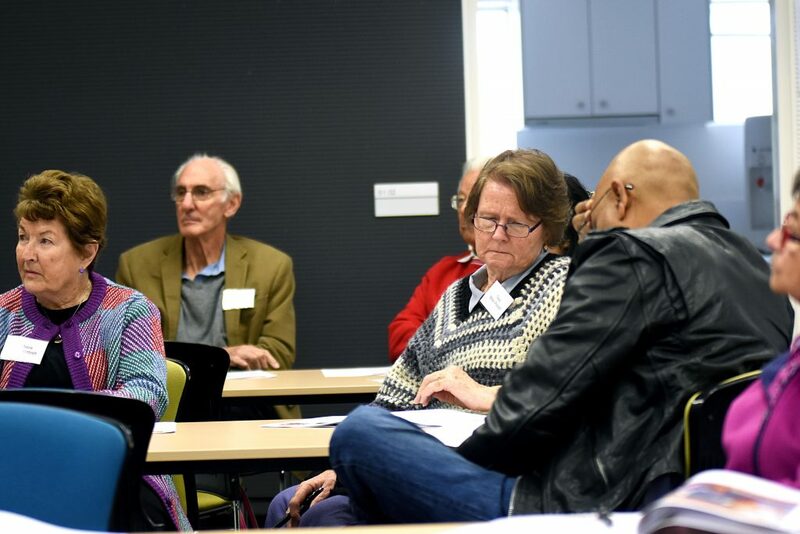 Held at the Newman Siena Centre in Doubleview on Saturday 20 May, the retreat was run by Team Leader of the Catechist Service Team at Catholic Education Western Australia, Dr Pina Ford. Participants were given an insight into and able to reflect on the key moments in the life of Mary: from receiving an unimaginable Annunciation, to seeking the company of Elizabeth, through to the sorrow of watching her Son suffer and die. A particular focus of the day was Mary’s Magnificat. Humble, powerful and filled with gratitude, Mary, who knows what God has done for her rejoices in the justice and tenderness of God’s revolutionary kingdom of mercy. Participants were able to reflect on the life of Mary from the Annunciation through to the sorrow of watching her Son suffer and die. Photo: Josh Low. Dr Ford spoke of Mary as being the most ordinary and the most extraordinary of God’s creatures. “The teaching of the Church has increasingly encouraged us to know Mary as the first and most perfect of Christ’s disciples, a model and a blueprint for us to imitate,” she said. Dr Ford said that reflecting on Mary stretches the boundaries of our hearts – both to embrace the most ordinary aspects of life and to ponder as Mary did, the incomprehensible mystery of God. “Participants were able to explore the humility, joy, gratitude and grace reflected in Mary’s life and to reconsider the place of these precious things in their life. “They were also able to reflect on the fact that Mary’s work of giving birth to Christ was both uniquely and exclusively hers, and in a different sense, the work of every human being and the desire of every heart. “In Mary, the Church contemplates the purpose for which it exists – to cooperate with the Spirit in bringing the life of Christ into the world,” Dr Ford said. Retreat participant, Julie Bogoni, said she gained a lot from the retreat and recommends it to anyone wishing to enrich their faith. “The retreat was a wonderful opportunity for me to escape the noise and chaos of family life and just sit for a little while. “A few things that struck me were exploring Matthew’s genealogy of Jesus with its unexpected ‘foremothers’, followed by understanding Mary in her time and place and being able to reflect on the immensity of the response of the young and afraid girl that was Mary at the Annunciation,” Mrs Bogoni said.